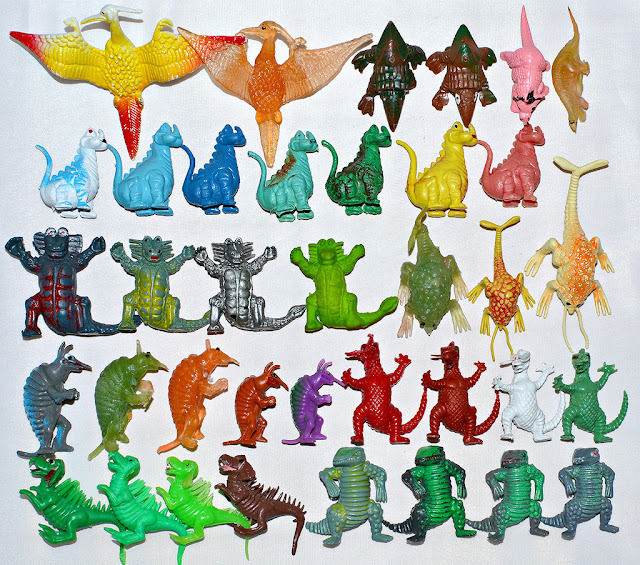 Little Weirdos: Mini figures and other monster toys: Chinasaurs: Is there such thing as too many? Chinasaurs: Is there such thing as too many? The answer to that question is, of course, no! Just for fun, I took this photo of my current collection of "Chinasaurs," or Hong Kong dino-monsters, or whatever else you want to call them considering they don't have an official name. What I love about these things is that because they've been around for decades and have been reproduced and knocked off so many times, there's a pretty much endless amount of variations out there to collect. In this photo alone, there's the standard hard plastic (badly) painted ones, smaller variations of them, hard plastic monochromatic ones, soft rubber translucent capsule machine and arcade bootlegs, and even an eraser (the solid green guy in the middle). I have been adding to this collection since I was a very young kid, and I'm sure I'll continue to do so for years to come. What about you? Do you collect these? How many different variations have you been able to find? Most of these are unfamiliar to me, but I have seen that pteradon...thing...in the top LH corner many times. Used to own one myself, from a bag of very low quality dinosaurs, back in about 1992. There was also a weird T-Rex/raptor hybrid that couldn't stand due to the way its foot had been sculpted.I believe both moulds are still in use today, haha! Haha yeah, these things will never die out...just when you think you've seen the last of them, new versions turn up! More plastic goodness, however some of this collection are rather weird looking. Got a few dozen of these things, always loved them - the thing is, I was a dinosaur NUT when I was 7 or 8 (who wasn't? ), and these toys came in bags of dinosaurs... And at that age you take EVERYTHING as truth, so I was going through every dinosaur book I could find, trying to find the name of that wonderfully ridiculous looking guy - the one standing on his back legs with his arms out and a big smile on his monkey-looking face. Haha yeah, I'd say that would never happen these days but they're still putting these things into dinosaur sets! I used to put the Pterodactyl/bird and the Styracosaurus with my Marx/superior/MPC pile because they were "reasonably realistic".The others were kept in a separate container with little cars ,buildings and an old plastic knight that stood in for Ultraman.It was my unlicenced "Ultraman Playset".I love digging through big boxes of plastic dinos at flea markets because I occasionally "unearth" on of these strange creatures.The little purple Armadillosaur just blew my mind.I found the larger pink one in that Walmart Dino tube a few years ago. I need to find one of the pink ones! My nearest Wal Mart never got those tubes. I got my son one of those tubes at Dollar General. I think some DG stores still sell them at least in the Ohio and West Virginia area. Too many? Have you got this Flu that's going around...the word doesn't compute! Yeah, from Ultraman to cheap plastic dino monsters to D&D...very cool history these toys have! I didn't know they had an Ultraman connection! Gonna have to look into that...! I've got a handful of these guys. They are so weird. I had them all! My father and I created a whole ongoing storyline with these guys! Third row on the left was the leader. I only have 2 bullettes, one bigger than the other. I hope to one day find the Owl Bear, though it may take a life time. You and me both! An Owlbear remains high on my wishlist. I have two owlbears, and plan to figure out how to create a mold and cast of one of them. Fear not, one day they will be available to collectors. That would be cool. I am still on the hunt for one. I'd like to find a genuine one, but in the meantime would be into a repro for sure. Actually I have most of these still, and always assumed (then found proof) that original D&D used them in the very beginning as monsters, so these toys came first. Also, what IS the Ultraman connection exactly? I think some of them were originally inspired by Ultraman monsters, and then later, the D&D creators based some of their monsters off them. I bought a bag of these around 1971 or so. The bird and other thing at the top were not included, colors were gray, brown, black, green. They came with some tiny cavemen, like the Tim Mee cavemen but smaller, in 2 pieces with a green band "loin cloth"in the middle! I swear I'm not crazy! But I have never seen anything like those cavemen since.